Sorry guys for disappearing. I needed some time to cool off from this. I ended up putting the receiver away(actually, just moved to my worktable in the basement), and have worked on and fixed a few other "little" things in the mean time. One of them being my meter... I guess the problems it had were just symptoms to a blown fuse I thought I killed it, and even purchased a (same model) replacement. So, now I have 2 of them digital multimeter's, along with my old analog mm. "Tape up the test prods, so only the tips are exposed"... That is a GREAT idea. I'm going to do that from now on. I'll probably just leave the tape on them. There are no fuses to my knowledge, except for the main fuse in the back of the receiver. "how were you measuring the bias?" I was measuring it across those resistors. Well, here's where I'm at guy's: I pulled the main output transistors and re-ohm'd them and compared to what I had written previously in my notebook. They were all about the same. None of them dead shorted. For S&G's I swapped them from one side to the other and tested the receiver. No change. Since I remembered someone talking about the driver transistors and possible issues, I decided to ohm them out too. Well, I found one that leads into the left channel's circuitry that has a dead short. I'm figuring that is/may be the main culprit. Like said above, I still need to check other component's. but, Is it likely that the dead channel is out because of that transistor? BTW, that transistor is a 2SA546A has an E in a circle after that part number and is also labeled MATSUSHITA, with another E underneath that. If you replace just one driver transistor unless you find an exact replacement you will need to replace all the driver transistors. Well, I would like it best if I could find an original to replace with. But, I noticed that the one that blew, in accordance with the schematic is not original. So, id like to find a same model replacement as what blew, or 2 of the original transistors that were installed in factory. Well, I finally got to testing those requested parts. My results are positive. Q507 I could not find... couldn't even match the transistor. Schematic shows a BF3 in place, but none to be found in actual circuit. So far, it seems other parts have all survived. Should I put a wanted add up for my needed transistor, or would that just be a waste of time? I don't know of any other units this transistor could be scarfed from if someone else happens to have some junk receivers sitting around. I did find a source for "new" Matsushita 2SA546A Transistor's. I hope you're using a LR-1500T schematic. There are differences between the LR-1500T and 1500TA schematics and board layouts. The LR-1500T doesn't use any 2SA546A transistors. The BF3 and DF3 are the driver transistors. You'll never find them listed on the market with these identifiers. The BF3 (PNP) (Q508, Q516) is 2SA485; the DF3 (NPN) (Q507, Q515) is 2SC485. In your text above, Q505 is 2SC458B. Why do they have to make things difficult!!! Anyway's, yes I am using a schematic for the 1500T, not the TA version. This receiver may not originally use 2SA546A transistors, but that's what's in here. It still has the 2SC485 in the other half. Here's the picture in better clarity so everyone can read and decipher what those top 2 drivers read on them. Hey, what could be causing that very light hiss in my right channel after the recap? Since I need to purchase some transistors, if I could find out what's causing it, I can see about finding a replacement for that too. The hiss would be one or several transistors. If this has a tape monitor switch turn it on and see if the hiss goes away. If it does then you know it's before the tape monitor. If it does not then you know it is after the tape monitor. Did you ever get yours working? I'm working on one now, that according to the owner "had no output". I blew the dust out of it and turned the volume control all the way down,which supposedly resets the overload protection circuit, and it now works. The multiplexer was not producing stereo so I replaced the coupling caps at the two 19kc transformers and one at the 38kc transformer. That fixed it. I notice this receiver has a "pop" at each speaker when its turned on . According to the owners manual this is normal. But it doesn't say how loud the pop is. It seems fairly loud and powerful. It also pops when turned off. I also have a 1000ta model that doesnt pop at all and doesn't mention that it should in the manual either. What would cause such a "built in" pop? This is an older design using a unipolar power supply that requires the use of large (2000uF in this case) output coupling capacitors. There will be a loud pop as the capacitors charge on power-up, and another one as they discharge on power down. Nothing to be done. The 1500T I'm working on has the exact same transistors in the exact same positions as the OP's. Two 2SA546A and two 2SC485. Lafayette did issue a service bulletin for the LR-1500T indicating that 2SA546A's could be used as a sub for the 2SA485's. The pop can be taken care of. Will require a DPDT relay with built in timer circuit capable of operating off 120Vac. House it in an external box connected between the amp and speakers. 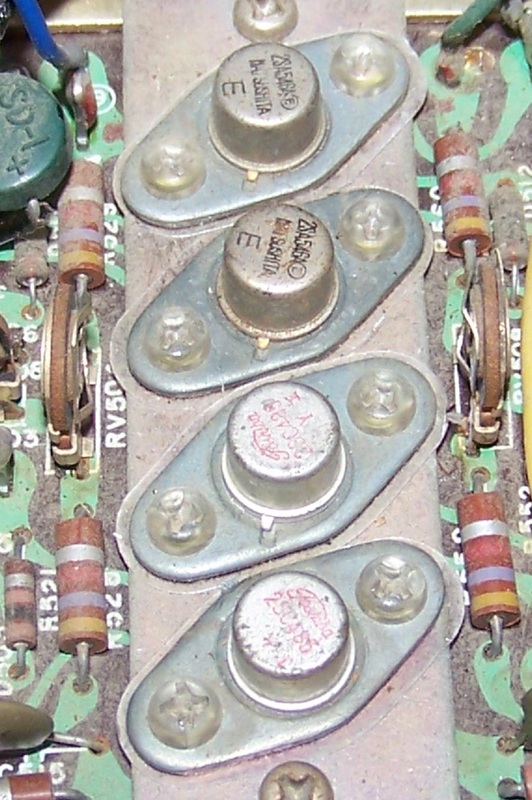 The NC contacts connect to two 100 ohm resistors and the NO contacts connect to the speakers. The delay is set for 1-5 seconds. The relay unit is plugged into the outlet on the receiver if it has one. Upon turn on the relay is delayed by 5 seconds which allows the caps to charge through the 100 ohm resistors. Upon turn off the caps discharge through the 100 ohm resistors. The preamp circuit in the 1500T is a tricky circuit to work on. As you switch inputs you are also switching in and out different feedback networks to match the input. The switch wafers have to be absolutely clean in order to work properly. I used a Chemtronics product called Tuno-Power. It actually reacted with tarnish and dissolved it away. Be careful with Deoxit products. They use solvents that can damage some components. Use sparingly and always test on a small area first.The other problem was the germanium transistors would go noisy. I have replaced them with silicon types like the 2N3904 and 2N3906 depending on polarity. The lR1500TA had all silicon devices. The amplifier had a 70 volt supply that was capacitive coupled. When you turned the unit on you would hear this tremendous thud as 35 volts was thrown across the speakers. A couple of years back I was ripping out the whole amplifier section and installing these Yuansing amplifier boards from China. It requires rewinding the power transformer to create a center tap in the 50 volt winding so the output can swing negative. The boards have a speaker protection relay built in and are a pretty good match gain wise. This is extreme solution when the amp is blown and the parts are NLA. You loose the muting function since that was implemented on the original amplifier board but other than that you can't tell the difference. And of course no more thud. People who paid me to do this pointed out the price in 1969 for a 1500T was $299 so to them it was worth it. That thud can be easily taken care of with a relay and delay circuit. The relay is DPDT and its NC contacts are connected to a 100 ohm resistor for each channel. The delay circuit energizes the relay after 2-5 seconds which disconnects the resistor and connects the speaker jacks. There are speaker protection boards on Ebay with all the time delay electronics built in. There is already a bleed down resistor so the 100 ohm is not necessary. The amp may not react well to switching the impedances abruptly. Best to let the amp stabilize and then make the connection to the speakers. Hey guy's. How you doin'? It's been awhile... too long in fact. I hope you are all still around here. Well, I just re-read my thread here. Wow, I really freaked out when I f'd up. To be honest, I thought I gave an update to this but see that I never did. I did get a new matching set of driver transistors for the one that was blown, and it's corresponding mate. Also swapped a few more caps and 1 or 2 other transistors that seemed "funny". Shortly after doing this though, I messed up again while taking voltage measurements and got so fed up that I covered the receiver up and forgot about it for several months in the basement. Last week, for the first time in 2018, I decided to pick back up on it. I have found that someone uploaded 2 service manuals and some extras on hifi engine(I think that's what it's called) and have been studying them over. I have just recently adjusted the balance and bias on the main amp board but noticed something odd. I have no voltage going across the "emitter"(red) resistors on the left channel. Before the last mistake (but after I changed the drivers) I had around .028vdc on each side measuring across the emitter resistors. Other than that, the receiver sounds nice. I still have that low volume hiss on the right channel. That is heard on all inputs and FM/AM when ever volume is down all the way. I figure like what ive been told, that its most likely one of the little transistors on the board making the noise. Just haven't figured out which one. So, been looking at the schematic and those service manuals and with the wonky circuitry, I cant figure out why I have no voltage across the emitter's on the left channel. Is that something I need to worry about? This came to mind this evening to me: Should i install a thermistor on the power line? The reciever doesnt thump the speakers but i was thinking for the sake of the old circuitry apon start up. Or do these stereo recievers not suffer so much inrush current? In my opinion a thermistor is not necessary for any device if it didn't come from the factory with one. Hmm, ok. Just with elevated voltages that many people state that they have now a day's, I figured it'd be something that would help bring down. Along with blocking the initial in-rush current when the unit is turned on. I have seen plenty of others that add it to tube equipment, especially in equipment that may be likely to blow the tubes heater elements. But that last (tube) part don't apply here, with the solid state. So..., what about my 0-voltage across those resistors? Do I worry about it? Ignore it? The unit doesn't sound bad, but I don't want it to grenade on me one day because I just ignored a possible problem.